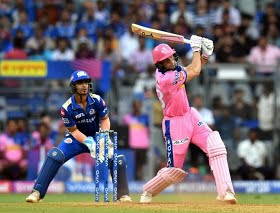 Rajasthan opener Jos Buttler admitted he's playing some of the best cricket he has played over an extended period of time after leading the side to an upset win over Mumbai on Sunday. Buttler smashed a scintillating 89 from 43 balls as Rajasthan chased down a target of 188. Speaking after the game, the man of the match Buttler said, "I'm playing the best cricket I've played over a prolonged period of time. I was disappointed to get out when I did but this is a great place to come out and play cricket." Rajasthan completely lost their way after Buttler's dismissal and just scraped home in the end. About it, Buttler said, "The last couple of overs were tricky and we desperately needed it. When you give quality teams a little bit of sniff, they get back into the game. "I'm nervous without any gloves on, but nice to have a runaround. We will take a lot of confidence from this win," he went on to say. Despite the win, Rajasthan skipper Ajinkya Rahane said he was not pleased with the way his side played. "It feels good to win, but not really happy the way we played. That one over changed the game. 30 ball 30, we should have won it easily. There was a bit of nervousness, but we backed Gopal and KG to do it for us. On the path ahead, Rahane said they know they need to win almost every game from now. "We were in a similar situation last year too. We need to play fearless cricket, and I personally enjoy playing at the Wankhede," Rahane said.